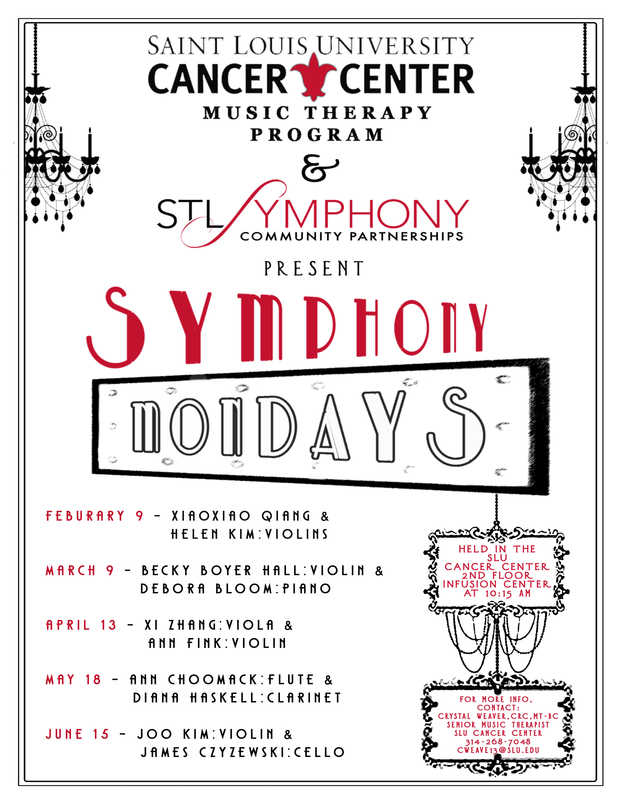 One of the many perks of having an outstanding relationship with the St Louis Symphony is that you get to treat patients to unique performance opportunities. One such patient got a celebratory concert by two of SLS’s finest on his Day Zero (when a patient receives his/her first Bone Marrow Transplant). This entry was posted in What's New and tagged AMTA, cancer, CBMT, Chemotherapy, courageous coping, Crystal Weaver, Health, Mark Fesler, Mark Varvares, Music Therapy, Saint Louis Symphony, Saint Louis University BMT Clinic, Saint Louis University., SLU Cancer Center, SLU Cancer Center Music Therapy Program, STLMTA.